Spirituality can be defined as your values, purpose in life, and what you do to define and find resolve within your goals. In week one, we touched on setting a firm foundation that is built on your values and your purpose in life – your inner being. We also touched on the importance of believing in who you are and not trying to be someone you are not. 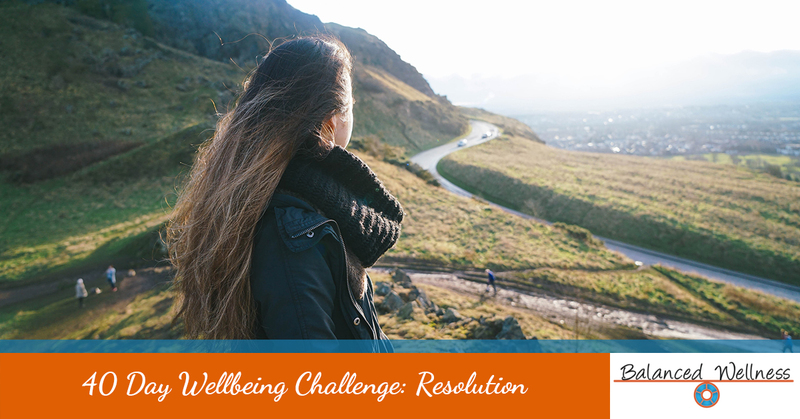 Taking the time to properly reflect on these issues is a crucial part of an effective wellness program and any lasting change. This week, our hope for you is that you will begin to work toward your action plan. You may not achieve it perfectly right away, or even at all in the beginning. But as you dig deeper into those things that help or hinder you from achieving the strategies (or behaviors) that move you toward your goal, you will be enhancing your spiritual life. This week, we are going to build off of last week’s advice and offer some more daily tips to keep you on the path toward optimal wellness. Day 8: Life is more than what we eat. Develop a daily journal/reflection time. During your reflection time consider those things you listed as important to you and reflect on how your plan is going in relation to these goals. This accountability can be the real meat of behavior change. Do you need to address emotional eating? Are you struggling with a firm resolution to changing a behavior? Spend day 8 focusing on your vision and on your purpose for wanting to change your behavior. Day 9: Live your life fully. Eat five fruits and vegetables today. Yes! Eating your fruits and vegetables can help you to live life fully. Not only do they provide important nutrients that give you energy and possibly decrease negative emotions such as depression, they can also help you reach and maintain a healthy weight. If you continue to journal (which we hope you will), note how you are feeling. Tracking just your fruits and vegetables is also a great activity for today. When you get to dinner, count how many vegetables (1/2 cooked or 1 cup raw) you have eaten. Before you put anything else on your plate, fill it with the remaining vegetable servings! Day 10: Refocus on your goals. Just as in previous days, take the time to look at your plan and reaffirm your goals and action. Practical tip for the day – do a 10-minute interval workout – strength and cardio. Day 11: Undivided heart. Do you believe firmly in your plan? Determination comes with a solid focus. Has there been a time you wanted something, but were not so determined that you would overcome any obstacle to get what you wanted? An undivided heart indicates that you do not waver at all. Spend today focusing on the heart of your effort and do all you can to ensure that your heart and mind are aligned to the purpose. Day 12: Restate your plan. Continuously reminding yourself of your plan can reaffirm your conviction, keep you on track, and give you the power to overcome your obstacles. Keep this in mind and focus your efforts on one action at a time. This is also a good time to look back at the affirmations you have written, or write some new ones! Day 13: Don’t be a people pleaser. It is your plan, not your friends! Enough said? Certainly do not continue to follow your plan if it is ineffective, but if it is working for you – ever so slowly or quickly – stick with it! Don’t go with the fad. A wellness program is an individual plan for achieving your optimal wellness. To be effective, it will include an individual assessment, personal vision, measurable goals, and a solid action plan. Our wellness programs are led by health coaches who leverage their passion, experience, resources, and expertise to develop a realistic action plan to help each individual become their very best self. Struggling to make your plan work? Consider wellness coaching. Learn about wellness coaching here.